Our practice goal is to provide excellent treatment in a caring environment Rogers & Andrews Orthodontics has been helping both kids and adults achieve handmade smiles since 1973, in fact, and that near half-century’s worth of experience has taught us a thing or two about helping our patients live with braces. We are an orthodontic care provider that is truly committed to creating confident, beautiful smiles in our patients, yes, but we also want to make sure that our patients are as happy as possible while wearing braces. Hence, today’s post concerns offering up a few braces care tips for both kids and adults, as the title no doubt already gave away. So read on if you are interested in making sure you or your kiddos have your bases covered when it comes to daily life with braces! Okay, this tip isn’t the most revolutionary point in the world, but it is nevertheless essential. When you have braces, it’s important to be consistent about your brushing habits, making a point to be both regimented and careful with your routine. Carefully brush using a soft-bristled brush to make sure all food and other debris are removed from your wires, brackets, and teeth. Be sure to brush between your brackets as well, using an interdental toothbrush to make sure all those nooks and crannies between the metal and your teeth get their fair share of attention. Oh, and you should brush your teeth after each and every meal, naturally. In terms of flossing, it’s even more important to do so on a daily basis when you have braces. If you find yourself having issues with getting the floss underneath the wires, consider buying stiff-tipped floss that is specifically designed for those of us with braces. 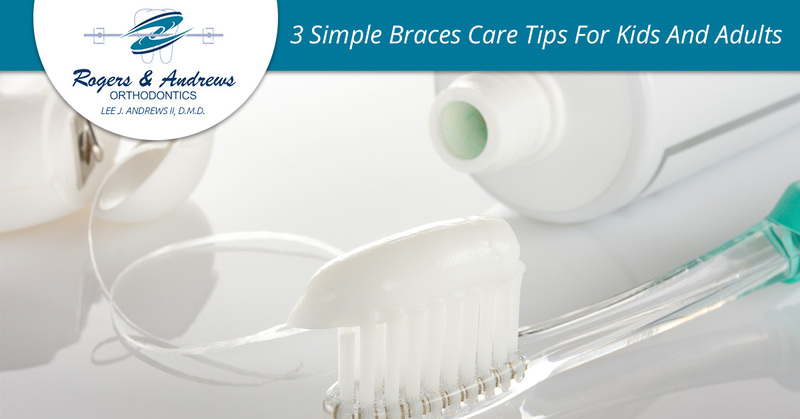 Ideally, you won’t be experiencing much pain outside of the first week after getting braces. But whether it is indeed shortly after getting your braces or you happen to be in pain for whatever reason, a warm washcloth or heating pad usually relieves soreness and discomfort when applied to the jaw. Another option is to gargle with saline, also known as salt water. Simply take a glass of lukewarm water, a teaspoon of salt, and swish it around in your mouth for about a minute or so. Then spit out the salt water and see if you don’t feel closer to pain-free! Sadly, there are certain foods that make life much more difficult than it needs to be for the braces-wearing folk among us. Any kind of food that is hard, crunchy, sticky, or chewy is probably an issue. Avoid sugary drinks as well So for all you caramel lovers out there, we understand that this is difficult news! However, heed our words: consuming these kinds of foods regularly can cause tooth decay and staining on the sections of your teeth surrounding your brackets. Remember, the goal here is not only to ensure you have a great smile and a healthy bite, but to help you achieve the most radiant smile you can! Rogers & Andrews Orthodontics is your go-to orthodontic care provider in Augusta, Thomson, and the CSRA. Give us a call to get started. We’d love to hear from you!